That little dimple at the bottom of a wine bottle is called a punt. (Insert witty half-drunken pun here after getting to the punt of your bottle). 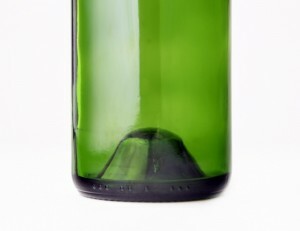 The reason punts exist is that when glassblowers would make the bottle, the seam would start to point through the bottom. The glassblowers would push them inward to make sure the bottle could stand upright and preserve the bottle's structural integrity. Now, the only wine that really still needs a punt is sparkling, because the punt allows for more distribution of pressure and keeps the bottle from exploding. So just remember, folks, it isn't the size of the punt the matters, it's the size of the bottle.